Learning objectives: Headline findings from the first pan-European ESCP audit, conducted in Spring 2015, will be presented during this session. The audit was highly successful, with around 280 units across Europe participating. In total, investigators prospectively collated patient, operation and outcomes data in a standardised and anonymised format on over 3100 operations during the study period. Details of the next ESCP Pan-European audit, and how sites can participate, will also be given. Thomas Pinkney is a Senior Lecturer in the Academic Department of Surgery, University of Birmingham and Consultant Colorectal Surgeon at University Hospitals Birmingham NHS Foundation Trust. He has a specialist clinical interest in inflammatory bowel disease surgery, and his academic time is dedicated primarily to clinical surgical trials. 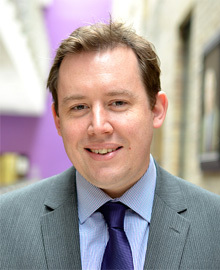 Whilst in surgical training in 2008 he was involved in the formation of the West Midlands Research Collaborative (WMRC), a trainee-led research group. He led the ROSSINI trial via the WMRC (2009-2012) which recruited 760 patients from 21 sites across the UK, before being published in the BMJ in 2013. He is lead of the ROCSS trial of biological mesh reinforcement of stoma closure sites and remains involved in the WMRC at a senior level. He is also currently Chief Investigator of the ACCURE-UK study, an NIHR-funded pilot study exploring therapeutic appendicectomy in ulcerative colitis, and Principle Investigator of four other portfolio studies. Pinkney TD, Morton DG. Novel approaches to surgical trials and the assessment of new surgical technologies. Br J Surg. 2015 Jan;102(2):e10-1. Nepogodiev D, Ward ST, Pinkney TD. Ulcerative Colitis Is Associated With an Increased Risk of Venous Thromboembolism in the Postoperative Period. Ann Surg. 2015 Apr 24.